LTD. BACK-STOCK !!! - UK production duo Alfie Granger-Howell and Nick Harriman aka Dusky drop 4 of the finest remixes from their Outer album campaign of last year on heavyweight white label vinyl. A legendary figure for his formative work on Jon E Cash's Black Ops label around 2002 - 2006, Dread D has been bubbling back into focus over recent years through a string of strong releases on Local Action. On his remix, the versatile veteran gives Wiley's freestyle a bashy, classic London grime refix. Having released his critically acclaimed 'Utility' LP on Livity Sound earlier this year, Bristol's Kowton has been bringing together cutting-edge electronics and heavy club dynamics with a distinctly UK sensibility - and felt a perfect choice for the second remix. Rising Berlin-via-Toronto producer Bwana aka Nathan Micay has built up an impressive run of releases over the past couple of years for labels including Aus Music, Infinite Machine and somethinksounds. Most recently he released an acclaimed "retro-futuristic reimagining" of the Akira OST with LuckyMe via a special website. 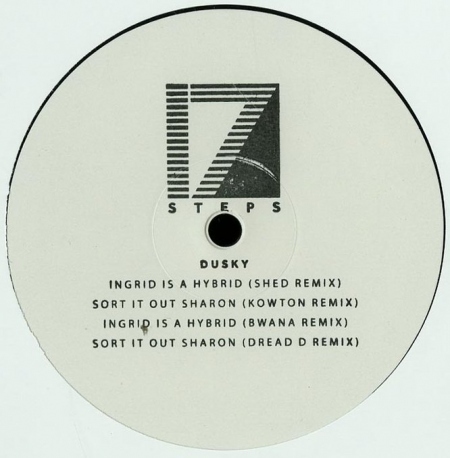 His 'We're All In This Together' remix of 'Ingrid Is A Hybrid' - which sees him reunite with Dusky, having previously played alongside the London duo in Chicago last autumn - builds from subtle percussion to new levels of computerized bliss. Shed is Ostgut Ton and Modeselektor/50 Weapons affiliate René Pawlowitz, also known by his Head High and WK7 aliases and for his time behind the counter at Berlin's legendary Hard Wax record store. With his version the techno maestro welds a dark sense of foreboding into 'Ingrid' while managing to retain the rave euphoria of the original.